To accompany the George Eastman Museum exhibition, Photography and America’s National Parks, the Eastman Museum and Aperture Foundation teamed up to publish assistant curator Jamie M. Allen’s new comprehensive book on the history of photography in our nation’s parks called Picturing America’s National Parks. The George Eastman show, made up of the work of more than 50 photographers from all eras in the history of photography, includes landscape photography greats such as Ansel Adams, Alvin Langdon Coburn, Imogen Cunningham, John K. Hillers, Philip Hyde, William Henry Jackson, the Kolb Brothers, Eadweard J. Muybridge, Eliot Porter, Bradford Washburn, Carleton E. Watkins, Edward Weston and Minor White, as well as a good number of other renowned photographers who also happened to make exposures in the National Parks such as George Eastman, Andreas Feininger, Lee Friedlander, Johan Hagemeyer, Martin Parr, Stephen Shore, Garry Winogrand and others. The exhibition has also turned out to be one of the most popular and prominent museum shows of the year. As such, during the run of the exhibit from June 4 – October 2, 2016, Photography and America’s National Parks has enjoyed significant publicity, while the book, Picturing America’s National Parks, already has attracted even greater press exposure. The exhibition or the book or both were introduced or reviewed in Antiques Magazine, Outdoor Photographer magazine, the Los Angeles Times, Aperture, Real Clear Life, the Rochesteriat, the Nature Conservancy magazine, the Rochester City Newspaper, Smithsonian Magazine, the Wall Street Journal, Fortune Magazine, Museum of Photographic Arts, Visit Rochester, The Atlantic, Tween Tribune, Artsy, Outside Magazine, AnOther magazine, Mother Jones magazine, USA Today, Yahoo News, Slate, Audubon magazine, Artbook, Travel & Leisure magazine, Pop Photo, and many others. The book can be found online to purchase, borrow or to read more reviews at Amazon.com, Aperture Foundation, Target.com, Bookshop.com, eBay, Google Play, Library Resource Finder, Sweet, Abelardo Morell, Schaumburg Library, Crystal Bridges Museum of American Art bookshop, Worldcat, Fraser Muggeridge Studio, Loot, LibraryThing, Lenscratch, Photolucida, ALA Booklist, Beyond Words, PDN Online and many, many others too deep in Google search results to track down. Like her pre-show introductory article in Antiques magazine, assistant Curator Jamie M. Allen’s main essay in the book is well written, smooth flowing and easy to read, yet packed with interesting history of both the national parks and early photography in them. The rest of the book displays the photographs with titles and an accompanying text for each of the featured photographers, interspersed with several paragraphs at a time on various historically relevant points such as the invention of the mass produced Kodak camera, the increase in availability of the automobile, the development of photomechanical and photolithographic postcards for sale at park concessions, 18-by-60-foot Colorama photo advertisements for the national parks, caretakers in the national parks and the National Park Service’s social media campaign #findyourpark. Interspersed with the images from each major contributor at approximately every 16 pages, a timeline page provides the reader with significant dates in the history of photography and the history of the national parks. These timeline pages are loaded with fascinating tidbits that enrich the reading experience of the book. Despite many details included, the timelines present history in general, broad strokes. There are significant points of history, especially of the parks that are not detailed, but this would require a much larger, more difficult to read book. Ms. Jamie M. Allen approaches her subject from a populist perspective, which is somewhat unusual for a museum curator. More than one of the reviews of Picturing America’s National Parks said it was a comprehensive history of photography in the national parks. This is partly true, depending on the definitions of these terms. On a more close reading though, I would say that this volume is not necessarily the history of fine art photography or landscape photography in the national parks, but it could more accurately be described as the history of all photography in the national parks, or a history of cameras and images of any kind from any source made in the national parks. This populist view of photography in the national parks puts significant emphasis on the various ways that photographs have helped to establish, preserve, depict and popularize the national parks. Allen observes that the history of the national parks is inextricably intertwined with the history of photography. After reading this inspiring book, I would go beyond saying that photography helped popularize the national parks to say that apparently the national parks helped popularize photography. In the development of the West, Allen points out that images produced on location at several of the most popular parks such as the Grand Canyon, Yellowstone and Yosemite became a hot commodity. A cottage industry in photograph sales developed with photographers establishing small shops where tourists could purchase various types of photographic reproductions of the scenery they had enjoyed during their visit and in some cases purchase photos of themselves in the scenery. The development of postcards, the snapshot camera and many other aspects of photography that were popular rather than professional, were a large part of the story of the intertwining histories. In addition these aspects make a more interesting read than a mere compilation of the great photographers who have depicted the national parks. Because some of the professionals have been left out, the collection of photographs represented acts less as a survey of those famous for photographing the parks and more as a compilation of famous people and ordinary people who also made images in the national parks. Both the exhibition and the book tie all of this history into current trends by bringing to light the masses of images and selfies made each day and shared hourly on social media. However, Allen and the Eastman Museum go beyond the mere mention of this phenomenon, to incorporating it as an activity at the exhibit. In the entryway to the show a photograph of the Grand Canyon containing a life-sized figure of George Eastman standing on the rim gives visitors to the show an opportunity to make a selfie with Mr. Eastman and the Grand Canyon in the background to take home, share on social media and discuss the exhibit with friends online. This feature and the encouragement of phone snapshots in the museum makes the visitor experience more fun while portraying the museum as cool and up to date in their delivery of history, not to mention making the show and the museum extremely popular, as well as the objects of considerable buzz. Allen and her team are to be commended for their fanning of the media flames through her appearance on local TV and the comprehensive development of publicity across the country, but also in their exhaustive and colossal volume of research necessary for such a project. As excellent as done, their research was not necessarily perfect, or perhaps for sake of simplicity and accessibility they chose to leave some information out. For example: the timeline for the 1960s is missing the introduction of color to photography books. Though the timelines are a small part of the overall book presentation, this was a major breakthrough for the parks, for photography and for the fortunes of Kodak because it caused a huge spike in the popularity of color film. It also was part of what led to the popularization of the coffee table photography book, which changed the face of the photography industry and paved the way for more photographers to make a living in the medium. In the timelines, there is also no mention of the Sierra Club Exhibit Format Series, which during the 1960s, especially in the Western U.S., but also all over the world, greatly advanced the momentum of the movement to conserve more public lands and to further popularize the national parks themselves. The timeline entry for 1963 mentioned that David Brower and Eliot Porter published several books on the parks, but the mention of popular books by Philip Hyde in the Exhibit Format Series, who is represented in the Eastman Museum collection, also is omitted. David Brower called Philip Hyde his go-to photographer because he produced the images for many books that made or protected national parks just in the 1960s alone, such as The Last Redwoods (1963), Time and the River Flowing: Grand Canyon (1964), The Wild Cascades: Forgotten Parkland (1965), Not Man Apart (1965) Navajo Wildlands (1967), The Grand Colorado (1969) and even more volumes in the 1970s. Philip Hyde’s book, Island In Time: The Point Reyes Peninsula (1962) was the first book to ever raise funds to purchase land to make a national park service unit, Point Reyes National Seashore. It was also published the same year as Eliot Porter’s In Wildness Is the Preservation of the World, (also not mentioned in Picturing America’s National Parks) in 1962, giving both books the shared title of the first major book projects published in color. I like Allen’s image choices for the sections on Ansel Adams, Edward Weston, Minor White and many of the others because she used photographs we don’t often see from these well-known masters. Adams as usual gets a huge amount of credit for his work in the national parks, most of which is well-deserved. However, also as usual, Adams gets credit for some of the accomplishments of other photographers such as the help in conservation and formation of national parks, which Adams did do some and quite effectively, but not more than or even at the same level as photographers such as Philip Hyde and Eliot Porter, who essentially took over the Sierra Club Books from Ansel Adams after they transitioned to color. The description under Ansel Adams carried on at length about conservation and the national parks, whereas the Philip Hyde description mentioned it only briefly, especially in light of his much greater volume of work on wilderness and national park protection campaigns. When I asked Allen about the difference, she said that originally her text included much more about Philip Hyde’s work in preserving national parks, but that her editors cut some of it. Apparently editors need educating as well about the figures behind major conservation efforts. Ansel Adams‘ (American, 1902-1984) lifelong passion for the national parks began in 1916 when, at the age of 14, he read James Mason Hutching’s 496-page book In the Heart of the Sierras (1886) and convinced his parents to take him on vacation to Yosemite Valley. Equipped with a No. 1 Brownie camera that his parents had given him, Adams took his first images of Yosemite that year. Soon after, he became involved with the Sierra Club, starting as the custodian for the club’s headquarters in Yosemite and later leading tours and participating in trips to the Yosemite High Country. He was eventually elected to the board of directors and lobbied for additional areas to be set aside as national parks and monuments. By the 1930s, Adams’ photographic work had become well known, and in 1941 he was invited to participate in a project to photograph all the national parks. Organized by the Secretary of Interior, the initiative was abruptly cancelled when the United States entered World War II. Adams continued the project independently, supported by a series of Guggenheim Fellowships. His images of the parks have come to represent the grandeur of the American landscape, conjuring a sense of pride for American viewers in both the land itself and the preservation of these spaces through the National Park Service. Adams’ photographs have also had broad international appeal, establishing the national parks as globally recognizable icons. In 1946, Philip Hyde (American 1921-2006) became one of the first students to attend the newly formed photography program at the California School of Fine Arts (now the San Francisco Art Institute). Here he studied under Edward Weston, Minor White, Imogen Cunningham, Dorothea Lange, and many other influential photographers of the time. After graduating, Hyde served as the official photographer of the Sierra Club High Trip during the summer of 1950, thus beginning his long relationship with the organization. His involvement with the club blossomed into relationships with other groups, including the Wilderness Society and the National Audubon Society. Hyde’s photographic work was used to advocate for and realize the preservation of places such as the Grand Canyon. 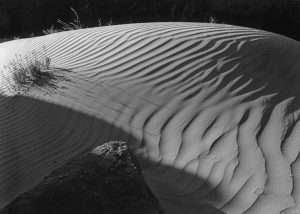 While he photographed the characteristic vantages of many national parks, his images also show atypical views, such as a sand dune at the Grand Canyon. Regardless, even with some omissions, Picturing America’s National Parks is destined to be a staple of bookstores, libraries, schools and universities for many years to come. I like the accessibility of the approach, the innovative layout and the depth of information presented in an easy to digest format. I like the cover art, but don’t particularly like the no dust-jacket cover. However, this keeps the costs down also adding to accessibility. Besides, this type of jacketless cover will likely prove ideal when the book is used as a textbook. It certainly ought to be mandatory reading for anyone studying photography, the national parks or any related outdoor curriculum. American entrepreneur George Eastman founded the Eastman Kodak Company and popularized photography through the mass production of film and the cameras he manufactured. While a number of entertainers and recording artists have more than one star in different categories on the Hollywood Walk of Fame, Eastman is the only honoree with two stars in the same category for the same achievement, the invention of roll film. Besides inventing roll film, Eastman also invented the roll film holder, developed dry plate technology that simplified the mechanics of photography and bromide paper, which became a standard in the industry. Eastman’s transparent film enabled Thomas Edison to perfect the kinetoscope, a box that allowed one individual at a time to view films through a small viewer window, the forerunner of the present motion picture. Eastman, after establishing a $200,000,000 industry, devoted most of his life to philanthropy. He pioneered sick pay, disability compensation, pensions and hospital benefits. He first distributed extra funds to employees doing a good job, one of the world’s first corporate bonuses. In the last decade of the 19th Century and in the first two of the 20th, he gave away more in wealth than anyone else besides John D. Rockefeller and Andrew Carnegie. His gifts made the University of Rochester and MIT into first tier schools. He was the largest supporter of the education of African-Americans in the 1920s, donating to colleges like Tuskegee, Hampton, Howard and Meharry. He established dental clinics for children around the globe and founded the medical and dental school at the University of Rochester. He organized community music instruction, funded music education programs and concerts and built the Eastman Theater, still one of the largest and most eloquent concert halls in the country. After his death in 1932, his 35,000 square foot home became part of the university, but proved too large for the president’s residence, as he had specified. In 1947, the state of New York chartered the George Eastman House as a non-profit museum of photography. After the Museum of Modern Art in New York City, the George Eastman Museum became the second museum in the world to have a photography department and also the second museum in the world to have a film department. The George Eastman Museum went on to develop one of the largest photography collections in the world including cinema art and photographic and cinematic technology, for a total of several million objects including over 450,000 photographs dating from the introduction of the medium in 1839 to the present. The collection also includes more than 28,000 motion picture films, one of the leading libraries of books related to photography and cinema and extensive holdings of documents and other objects related to George Eastman. Each year now the museum presents at least ten curated exhibitions. However, in the early days of the museum, shows were not as frequent. In 1957, when Beaumont Newhall was head curator and Minor White was an assistant curator, the George Eastman Museum hosted a solo exhibition of the black and white prints of a new leading nature photographer and prolific user of Kodak paper and large format sheet film, Philip Hyde. The show consisted of 25 silver gelatin prints, three of which were purchased for the George Eastman House permanent collection. From the early pioneers such as Alvin Langdon Coburn, Frank Jay Haynes, William Henry Jackson, the Kolb Brothers, Eadweard Muybridge and Carleton Watkins to the modernists including Ansel Adams, Edward Weston and Philip Hyde to contemporary photographers such as Marion Balanger, Binh Danh, Sean McFarland, Sharon Harper, Mark Klett, Abelardo Morell, David Benjamin Sherry and Byron Wolfe, exhibition curator Jamie M. Allen drew primarily from the George Eastman Museum collection to illuminate the history of the most significant national parks from the 1860s to the present. The exhibition also includes works on loan that broaden and deepen the presentation, as well as George Eastman’s travel albums from his trips to national parks. 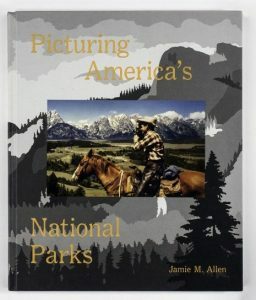 To compliment the exhibition, the museum is co-publishing a book with Aperture titled, Picturing America’s National Parks, with introductory essay by Jamie M. Allen discussing the relationship between the parks and photography, available in June from the museum store and online at Eastman.org/store. Curator Jamie M. Allen wrote an informed and well-written article about the history of photography in the national parks for the March/April issue of Antiques, The Magazine. David Leland Hyde also wrote about the exhibition for the June issue of Outdoor Photographer magazine. The same June national parks special issue of Outdoor Photographer, is graced by a cover photograph by Carr Clifton, protégé of Philip Hyde, and a special feature article by David Leland Hyde about Philip Hyde’s role in conservation campaigns that helped establish or expand more national parks and wilderness lands than any other photographer. The June special issue of Outdoor Photographer will be on newsstands this Tuesday. For more information see the Exhibition Preview. To find out about related events throughout the summer go to Philip Hyde in Photography and America’s National Parks Exhibition–Programs and Lectures at Fine Art Photography Collector’s Resource. Don’t Miss Anything! Subscribe To Receive Blog Posts By E-mail. A Blog For the People and By Them: For Wilderness Lovers, Photographers, Collectors, Visionaries, Conservationists, Environmentalists, Monkey Wrenchers and Peaceful Revolutionaries. "Ansel Adams is better known, but Philip Hyde--even more than Eliot Porter--became our model for committing a career and a life to conservation through color photography." --Stephen Trimble, 2006. Visit PhilipHyde.com to Read More and See Vintage Color as well as Black and White Photographs of the American West. Did Velvia Film Change Landscape Photography? © 2019 Landscape Photography Reader: Beyond Art & Environment · Proudly powered by WordPress & Green Park 2 by Cordobo.